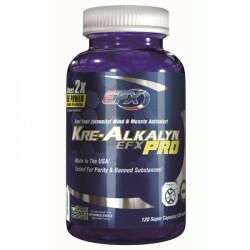 EFX Kre-Alkalyn Nitro Pro combines two top products - EFX Kre-Alkalyn Pro with EFX Nytric! 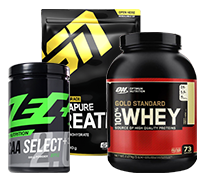 EFX Kre-Alkalyn Nitro Pro is for all bodybuilders and strength atheltes first of all. 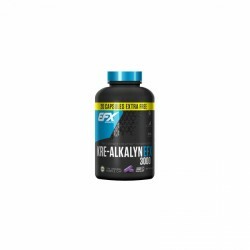 Though even stamina and ball sportsmen can benefit from EFX Kre-Alkalyn Nitro Pro. EFX has developed Kre-Alkalyn Pro, a product that surpasses the effectivity of EFX Kre-Alkalyn. The EFX Kre-Alkalyn Pro is higher dosed and contains more Kre-Alkalyn (1200mg per capsule) than its predecessor. The Pro version has Kre-Alkaloids. - High dosage with 1200mg of Kre-Alkalyn per capsule ! - Incl. Kre-Alkaloide (75mg per capsule) !